A desert is an arid land area that generally receives less than 10 inches (250 millimeters) of rainfall per year. What little water it does receive is quickly lost through evaporation. Average annual precipitation in the world's deserts ranges from about 0.4 to 1 inch (10 to 25 millimeters) in the driest areas to 10 inches (250 millimeters) in semiarid regions. Other features that mark desert systems include high winds, low humidity, and temperatures that can fluctuate dramatically. It is not uncommon for the temperature to soar above 90°F (32°C) and then drop below 32°F (0°C) in a single day in the desert. Most of the world's desert ecosystems (communities of plants and animals) are located in two belts near the tropics at 30 degrees north and 30 degrees south of the equator. These areas receive little rainfall because of the downward flow of dry air currents that originate at the equator. As this equatorial air moves north and south, it cools and loses whatever moisture it contains. Once this cool, dry air moves back toward Earth's surface, it is rewarmed, making it even drier. Over the desert areas, the dry air currents draw moisture away from the land on their journey back toward the equator. The vast Sahara Desert in northern Africa encompasses an area 3,000 miles (4,800 kilometers) wide and 1,000 miles (1,600 kilometers) deep. Sand composes just 20 percent of the Sahara, while plains of rock, pebble, and salt flats, punctuated by mountains, make up the rest. The Sahara can experience temperatures that rise and fall 100°F (38°C) in a single day. Decades can go by without rain. By contrast, the Gobi Desert, covering 500,000 square miles (1,295,000 square kilometers) in northcentral Asia, sits at a higher altitude than the Sahara. As a result, temperatures in the Gobi remain below freezing most of the year. Arid land: Land that receives less than 10 inches (250 millimeters) of rainfall annually and has a high rate of evaporation. 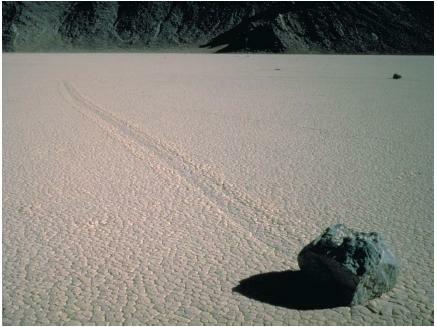 Desert pavement: Surface of flat desert lands covered with closely spaced, smooth rock fragments that resemble cobblestones. Desert varnish: Dark film of iron oxide and manganese oxide on the surface of exposed desert rocks. Rain-shadow deserts: Areas that lie in the shadow of mountain ranges and receive little precipitation. the Outback. Antarctica, the land mass at the southern pole of the globe, is a polar desert. One of the driest places on Earth, it receives only a dusting of snow each year. Warmest summer temperatures in Antarctica reach only 25°F (−4°C). The deserts of the United States are located at higher latitudes and in higher altitudes than is typical of many other arid regions of the world. Death Valley in California is both extremely arid and extremely hot in the summer. South of it are the relatively cooler and wetter Mojave and Sonoran Deserts. Valley (in the shadow of the Sierra Nevadas) and Argentina's Patagonian and Monte Deserts (in the shadow of Chile's Andes). Dunes, wind-blown piles of sand, are the most common image of a desert landscape. Wind constantly sculpts sand piles into a wide variety of shapes. Dunes move as wind bounces sand up the dune's gently sloping windward side (facing the wind) to the peak of the slope. At the peak the wind's speed drops and sends sand cascading down the steeper lee side (downwind). As this process continues, the dune migrates in the direction the wind blows. Given enough sand and time, dunes override other dunes to thicknesses of thousands of feet, as in the Sahara Desert. Desertification refers to the gradual transformation of productive land into that with desertlike conditions. Desertification may occur in rain forests and tropical mountainous areas. Even a desert itself can become desertified, losing its sparse collection of plants and animals and becoming a barren wasteland. Desertification occurs in response to continued land abuse, and may be brought about by natural or man-made actions. Among the natural forces are constant wind and water (which erode topsoil) and long-term changes in rainfall patterns (such as a drought). The list of human actions includes overgrazing of farm animals, strip mining, the depletion of groundwater supplies, the removal of forests, and the physical compacting of the soil (such as by cattle and off-road vehicles). Almost 33 percent of Earth's land surface is desert, a proportion that is increasing by as much as 40 square miles (64 square kilometers) each day. The arid lands of North America are among those most affected by desertification: almost 90 percent are moderately to severely desertified. Fortunately, scientists believe that severe desertification is rare. Many feel that most desertified areas can be restored to productivity through careful land management. Sand carried by the wind can act as an abrasive on the land over which it flows. Rocks on the floor of a desert can become polished in this way. Closely spaced, smooth rock fragments that resemble cobblestones on the surface of flat lands are referred to as desert pavement. The dark film of iron oxide and manganese oxide on the surface of the exposed rocks is called desert varnish. The plants and animals that are able to survive the extremes of desert conditions have all evolved ways of compensating for the lack of water. 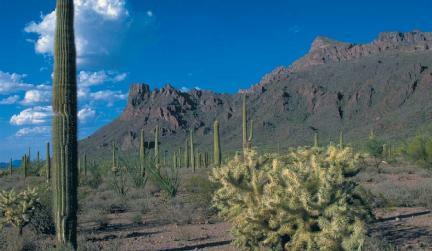 Plants that are able to thrive in the desert include lichens (algae and fungi growing together). Lichens have no roots and can absorb water and nutrients from rain, dew, and the dust on which they grow. Succulent plants, such as cacti, quickly absorb rainwater when it comes and store it in their stems and leaves, if they have them. Other plants store nutrients in their roots and stems. Many desert shrubs have evolved into upside-down cone shapes. They collect large amounts of rain on their surfaces, then funnel it down to their bases. Deserts are not lifeless, but are inhabited by insects, arachnids (spiders and scorpions), reptiles, birds, and mammals. Unlike plants, these animals can seek shelter from the scorching sun, cold, and winds by crawling into underground burrows. Many have adapted to the harsh desert environment by developing specific body processes. Some small mammals, such as rodents, excrete only concentrated urine and dry feces, and perspire little as a way of conserving body fluids. The camel's body temperature can soar to 105°F (41°C) before this mammal sweats. It can lose up to one-third of its body weight and replace it at a single drinking. i was doing a project on the sahara desert and when found this artical was verry prud of the way it was setted out how ever when i first looked at this i thought it just needs something for me to make me read it and it was only that i was finding it hard to find the information i wanted i read it, i think that the sub headings and headings need to have a different colour to make it stand out. this article is very usful with georgraphy and when you are young and you are leaning about desterts and climates. how do I come to know what materials compose the desert sand, rock, and pebbles -most notably that of the Sahara? I understand it will vary by region, but there must be an overall composition or unifier. IF you have any leads on how I could discover this information in detail, please let me know! This Is An Amazing Site For My Pre-AP Science Class.